4 Steps to a Radiant Complexion! Note: To prevent causing more dryness on dry skin, stay clear of rinsing your skin with hot water. 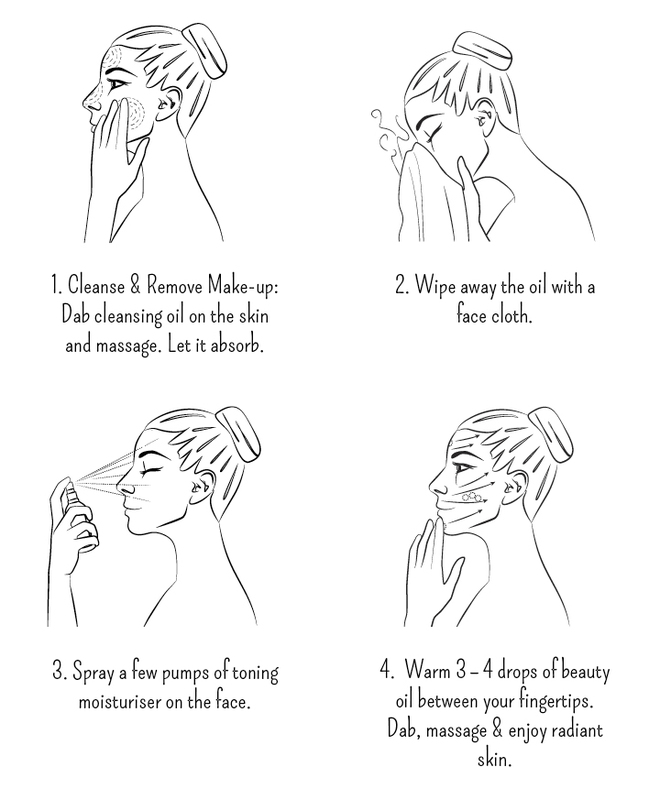 If you have dry skin, skip step 2 and wipe away the cleansing oil with a cleansing pad instead. Applied too much oil to your skin? No problem. Let the oil absorb into the skin for 1 - 2 minutes and remove any excess with a facial tissue. During the day: Less is more. Approximately 3 - 4 drops of Beauty Oil is sufficient (exception: more oil can be used on dry skin). When retiring for some well deserved rest, more oil can be applied to the skin since the nutrients are best absorbed during the regeneration phase. Use this effective beauty ritual every morning and evening and you'll soon notice long-lasting improvements. Your skin may require some time to restore its natural balance. Give the new skincare ritual at least a week before visible results can be seen. Your skin will love you for the benefits of a fresher, more radiant appearance.